Download an image of an infectious microbe here. 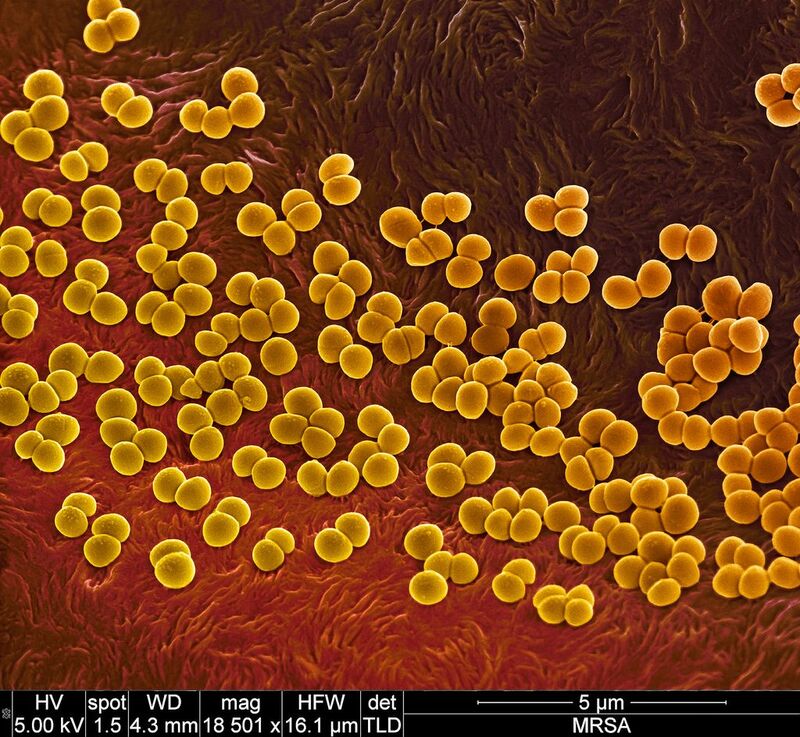 This is an image of methicillin-resistant Staphylococcus aureus (MRSA), a species of bacteria, on the surface of a wound dressing. MRSA is resistant to many antibiotics, and is a major problem in hospitals, where it can lead to life-threatening pneumonia and bloodstream infections. Read through the great New York Times article and work through its questions as we did here. Antibiotics are substances that can stop or slow the growth of certain living (biotic) microbes, such as bacteria. Penicillins are probably the most famous strain of antibiotic. In this case, “bug” means a microscopic organism, such as a bacterium or fungus. Sometimes, when microbiologists refer to “bugs,” they mean a pathogenic subset of these microbes—ones that cause or augment infection. These bugs are also called germs. Antibiotic resistance (also called antimicrobial resistance) describes the way bugs have evolved to resist antibiotics. Is antibiotic resistance a new phenomenon? No. “For some years now, infectious disease doctors have been warning that unless we rein in use of antibiotics in both people and livestock, there will come a day when they will be powerless against the most ferocious bugs, turning the clock back to the early years of the 20th century,” when infectious diseases now targeted by antibiotics, such as pneumonia, killed thousands. Do we want antibiotics to get rid of all the bugs in our bodies? Nooooooo! Humans all have a rich microbiome of commensal and symbiotic, as well as pathogenic microorganisms. We want to keep these microbiomes healthy. “CRE, which stands for carbapenem-resistant Enterobacteriaceae, is the most fearsome family of germs because it is resistant even to last-resort antibiotics.” Klebsiella pneumoniae (associated with pneumonia) and Escherichia coli (E.coli) are both in the Enterobacteriaceae family and can become carbapenem-resistant. Patients are more susceptible to “C. difficile, a gut germ that flourishes when the patient has taken a lot of antibiotics.” Last year, more than 20,000 people died after being diagnosed with a C. difficile infection. Should I be scared about antibiotic resistance? Not yet. CRE infections are still relatively rare, responsible for about 600 deaths a year. Even the woman with the “superbug” made a full recovery thanks to antibiotics. So what are health officials worried about? Since hospitals are incubators of dangerous germs, if you end up in one, try to get out as fast as you possibly can. If you get sick, try not to use antibiotics. Is there really a risk in taking an antibiotic for a cold? Do humans and livestock get the same antibiotics? Yes, most antibiotics used for humans are also used for livestock. Humans can come in contact with resistant bacteria through eating insufficiently cooked meat. Humans can come in contact with resistant bacteria through eating food products that have come into contact with antibiotics, such as crops that have been fertilized with manure from animals treated with antibiotics. Farmworkers and people working in slaughterhouses or food-production facilities are particularly at risk. Is the government addressing the issue of antibiotic resistance? Yes, but industry compliance is voluntary.